An instructor stood around the crease area with about 12 youngsters lined up on the goal line facing him. He had a couple of young assistants, likely current junior players. So certainly the teacher:pupil ratio was pretty good. But a proper ratio is only of value if actual teaching and feedback take place. There was little of either. The head fellow, a man in perhaps his 40s who assists with a local junior club, told the kids what to do, gave a brief demo, and sent them on their way towards the centre red line. They stopped—sort of—and turned back, repeating the skill. The head instructor never left his spot. His assistants dealt more with guiding the kids to where they had to go. Everyone was pleasant and positive, certainly a plus. But this was a summer hockey school and one would think there’d be even a modicum of proper instruction and decent progressions. Nope. 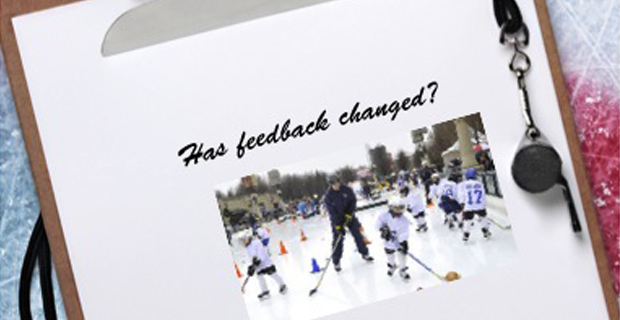 The session reminded me of a hockey school I worked at in Montreal in the 1970s. A number of the Montreal Canadiens “taught” at it while a few of us served as those same young guys I just described. One morning, Rejean Houle, a phenomenal skater, ran a session on crossovers. There were about 35 kids on the ice. He lined them up on a goal line and stood in the slot. In broken English, he told the kids what he wanted them to do, which was to stand facing one direction and do side crossovers all the way to centre ice—like this. . . And he proceeded to demonstrate with the fastest footwork I’d ever seen. His skates crossed and crossed with nary a technical error till centre where he stopped, looked at the kids, and bellowed, “Then come back,” and repeated the performance. He actually left deep divots in the ice. So the kids tried to copy him. It was like watching a bunch of drunks stagger out of a bar at 3 am. Some fell right away; some took a few steps and fell; some went slowly to avoid falling, but eventually toppled over anyway. The assistants - me and the others - did our best to assist them but we were overwhelmed because nothing had actually been taught. Reggie—yes, we got to call him Reggie—just smiled and slapped his stick to encourage the kids to go faster. Fast forward and a similar approach still happens. You can’t expect kids to either learn or improve without proper progressions and effective feedback. We know that from the school system, even with its faults. How come hockey instructors haven’t figured it out?